If you’ve been following us for a while, then you know that I travel a lot! Whilst I’ve got my post-flight routine down to a science, I never hesitate to try a product that will uplift my skin further. With that in mind, I decided to try out the Instagram’s current favourite product i.e. the Summer Fridays Jet Lag Mask. The mask comes packaged in a gorgeous, powder blue squeezable tube. The packaging is clearly made for Instagram, which is something to expect considering that the brand has been founded by 2 famous influencers - Marianna Hewitt and Lauren Gore. The ingredients and directions for use are printed at the back. The brand gets major brownie points for being cruelty-free, vegan and void of any parabens, synthetic dyes, fragrances and sulfates. The tube format is also more hygienic than jars and is lightweight enough to pack in a carry-on. Upon application, I found this mask to be a delight. The consistency is akin to that of an emollient cream and glides smoothly across skin. Although it comes out white from the tube, it rubs down to a transparent finish. However, it does leave behind a dewy film. It also has a slight minty fragrance, which dissipates after a few seconds. The formula does not need to be rinsed off, so after leaving it on for 20 minutes, I blotted the excess off with a tissue. Whilst the brand does recommend applying a visible layer, I found that two pea-sized blobs is all my face really needs. I’ve been using this mask twice a week, for about 3 weeks now – both on and off flights. 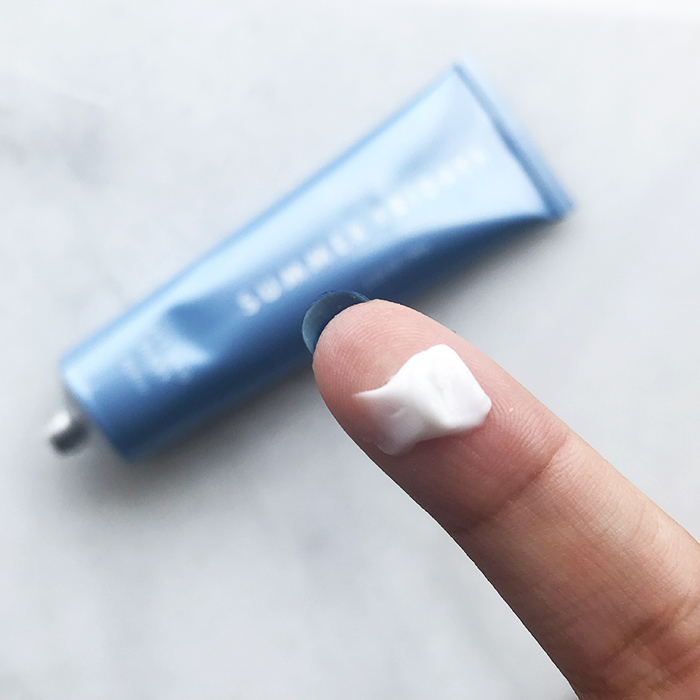 Whilst it doesn’t provide deep hydration, it works beautifully to counter small, dry patches and refresh tired skin. It also gives my skin a subtle glow, which I’ve come to adore. Although my skin is prone to breakouts, this one has not caused a single blemish till date. Honestly, I prefer carrying this tube around rather than slipping on a sheet mask. Apart from the fact that it does not scare off my co-passengers (as several sheet masks have), it also doesn’t drip and cause a mess. If you are using it at home, I recommend that you put it in the refrigerator beforehand. The chilled formula really does wonders on puffy eyes. I’ve also used this as an overnight mask and can attest to the fact that I woke up with a plumper and softer complexion. Although the founders recommend using it as a primer for makeup, I found it to be a touch too greasy for that. Lightly hydrating, glow-inducing and creamy, this mask is certainly made for summer. Whilst it is on the pricier side, the TSA-friendly size (2.25 oz) is definitely a boon for frequent travellers.